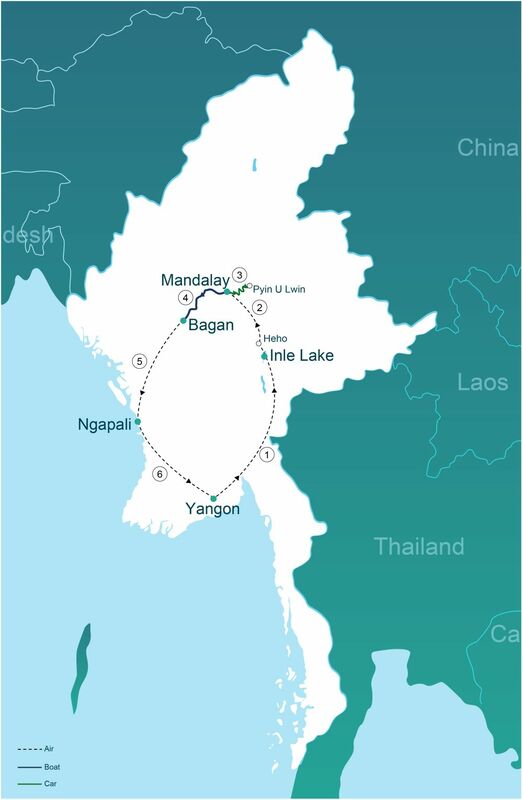 Enjoy the highlights of the heart of Myanmar, from beautiful lakes and rivers to the thousands of temples of Bagan, as well as the botanical gardens and waterfalls of Pyin Oo Lwin, before heading down to the stunning beaches on the Bay of Bengal for some seaside fun and real R&R. Myanmar people give family and home the highest respect; they especially love children and care for them as if their own, making a family holiday to Myanmar an unrivalled delight. After being welcomed by your Go-Myanmar.com representative at Yangon International Airport, rest up at your hotel before heading out to explore downtown. With its colonial architecture, variety of restaurants and bustling vibe, Yangon has become a lively city that is tourist friendly. Finish off your day with sunset at the Buddhist heart of Myanmar – the dazzling Shwedagon Pagoda. Fly the next morning to Heho airport and transfer to the characterful town of Nyaung Shwe, at the northern end of Inle Lake; if you go for the superior hotel option, a boat will take you to your hotel on the lake (standard hotels are in Nyaung Shwe). There will be some time to enjoy some sightseeing around the floating villages and garden of Inle, or relax with your family and take in the pristine environment of the lake and the surrounding Shan Hills. Overnight at hotel in Inle Lake. After breakfast, visit the ancient lakeside stupas at Indein and see workshops at Nampan village, where you will have the chance to buy handicrafts from small local businesses, contributing to the local economy. If the time is right, see the floating markets that are a photographer’s dream. See the local Intha fishermen employing their traditional one-leg rowing technique – and the children will love the beautiful Burmese cats that live on the lake at the Inthar Heritage House. Overnight stay at hotel in Inle Lake. Travel day from Inle, to Heho airport and then Mandalay, with some time for sightseeing in the evening – including stunning sunset views over the city from Mandalay Hill. In the evening, take the chance to try out one of the city's fantastic eateries, including Indian, Shan or Chinese food - supporting small-scale business by buying from local vendors. Transfer to the hotel and overnight at hotel in Mandalay. Sightseeing day around the city of Mandalay. Visit the last royal palace of the Konbaung dynasty; take a trip to the revered Mahamuni Pagoda; and explore the Kuthodaw Pagoda, which houses the largest book in the world (made of stone!). Later in the day, head south of Mandalay and make an offering to the young monks of the Mahagandayon Monastery, which houses an important monastic school. Then take a stunning sunset stroll down the longest teak bridge in the world, the iconic U Bein Bridge. A two-hour drive from Mandalay, Pyin Oo Lwin is a picturesque hill station that was a summer playground for the colonial elite of old Burma. Grab a bicycle with the family and cruise around or jump aboard a cute and colourful local horse and cart taxi – working relics of bygone days. Ride to the botanical gardens and admire this green and beautifully maintained English-style retreat. Spend the night in Pyin Oo Lwin. Wake up the following morning nearly 1,000 metres above sea level. Spend the morning voyaging to pretty waterfalls in the vicinity, which have plenty of areas for safe paddling or renting a motorcycle and going on an adventure. In the late afternoon, drive back to Mandalay and spend the night there. Start early and have complimentary breakfast on the boat to Bagan; enjoy the beautiful Irrawaddy riverside views and take this time to relax, read a book or write those postcards back home. We recommend you bring warm clothing for the early morning and sun protection as the day grows hotter. Arrive in Bagan in time for one of its famously stunning sunsets. Spend a full day exploring the extraordinary Bagan plain, beginning with the Ananda pagoda, dating from the 12thcentury and famed for its gilded sikhara tower. Gubyaukgyi pagoda has extensive murals of Buddha in his previous lives and the Gawdawpalin or Bupaya pagodas are great for sunsets. Choose from bicycle, horse and cart or minibus to explore the area. The area is renowned for its lacquerware, and we will have an afternoon visit to one of the local shops in the town of Myinkaba, supporting local privately-owned businesses. Extra cost option: start the day with a spectacular hot-air balloon ride that will give you amazing sunrise views of the temples (there are minimum height restrictions). Take a plane from Bagan to Ngapali Beach for your first day on the magical Bay of Bengal coast. After arrving at your hotel in the afteroon, have a drink by the pool or go for a swim in the sea. The beaches of Ngapali are world-renowned for their white sand and clear blue water. Find a spot with a good view for sunset, a truly wonderful experience where on a clear day the full red sun can be seen dipping fully into the sea, often illuminating the sky with a beautiful vareity of colors. Wake up the following morning to one of the most relaxing places on earth. Ngapali is famed for its white sand, gentle surf and the freshest grilled seafood in Myanmar. Lie back in this paradise, or try some adventure by snorkeling or scuba diving among the brightly coloured fish. Other activities include fishing boat trips, kayaking or cycling down the idyllic beaches past quaint fishing villages. A final day to take in the sea air and sunshine. Rent a motorcycle and head up north to more seculded beaches or inland for a backcountry adventure. Depart Ngapali for Yangon. Rest up or enjoy more sightseeing around the city, where you can try some sweet laphayet (Myanmar tea) at one of the many downtown teashops. Pair it with some fresh ee char kway, a deep fried dough snack to be really naughty and then walk it off with a shopping trip for some last minute presents at the famous Bogyoke (Scott) Market or one of Yangon's social enterprises, which put their profits back into local communities and focus on professional training for the underprivileged. On your final day, check off the final tics of the Myanmar bucket list: take a carefree stroll around Kandawgyi Lake, explore the markets and pagodas that line Yangon's riverfront, pick up last minute souvenirs, or get a massage and relax before your flight. Price per person based on twin sharing during high season (Oct-Apr). Where possible, family bungalows and larger suites will be secured. Larger groups will pay less per person.